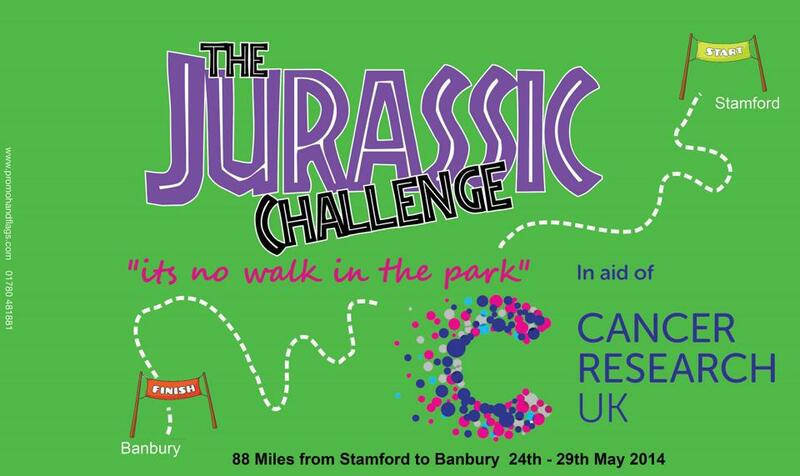 When my chum Andy Croson told me he would be walking the Jurassic Way to raise money for Cancer Research, I told him I would walk a section with him. I’ve known Andy for over 40 years and in recent months another mutual and very dear friend from our school days together was diagnosed with bowel cancer. Earlier this year he received radio and chemotherapy treatment followed by a particularly long and involved operation. Although there are never any guarantees, the signs so far suggest that the prognosis is very positive and optimistic. There’s nothing one can do in these circumstances. We can’t actually do anything to take this illness away and there’s a distinct feeling of helplessness. All we can do is to continue to be the friends we’ve always been. Andy however felt that he needed to do something more, something that in some small way would at least give some support back to a system that had treated our chum so well. He decided he’d try to raise as large a contribution as he could for Cancer Research. His ‘Jurassic Challenge’ route would follow undulating countryside over rocks from the Jurassic Period (c.140-195 million years old) along a limestone ridge from Stamford to Banbury passing through Lincolnshire, Northamptonshire, and Oxfordshire. The whole route would be 88 miles and he planned to complete it over 6 days. The ‘Jurassic Challenge – It’s No Walk in the Park’ concept was transformed into a concrete plan. He began walking in the rain on Saturday 24th May and weather conditions haven’t been very kind since. Although Day 2 was warm and sunny, the rain has been a dominating feature. The Day 4 section when I chose to join him and which took place yesterday, was no different. We were rewarded with magnificent views of some beautiful countryside as we made our way from the Wharf Inn at Welford and beside the Grand Union Canal toward Elkington and Honey Hill, then to Winwick, taking time out for a swiftish half in The Crown at West Haddon, and on to Watford, finally arriving at the Olde Coach House in Ashby St. Ledgers, a distance of about 14 miles, at around 6.00. Songs such as ‘Purple Rain’, ‘Down Came The Rain, It Happened Again’, ‘Raindrops Keep Falling On My Head’, ‘A Hard Rain’s Gonna Fall’ and ‘I Can’t Stand The Rain’ became worthy contenders amongst many others to stake a claim for the title of this blog. Scribbling in a wet notebook is never easy but a combination of both drawn and photographic diary present a picture of our day together. We walked for 8 hours across a soaked but stunning landscape, our usual lively conversation typically filled with a rich variety of humorous anecdotes. The only strange part of our day was that there was definitely the feeling that someone was missing. Despite being with us in mind rather than body – we were still two instead of our usual three. Hopefully, sometime in the not too distant future, we’ll be walking as three again.